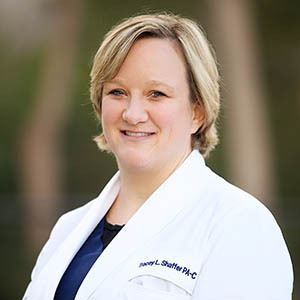 Tracey Shaffer, PA-C joined Savannah River Dermatology in 2016. She is a native of Savannah, GA and a graduate of Augusta State University, She attended PA school at Georgia Regents University and graduated in 2015. She is a member of the Society of Dermatology Physician Assistants and Georgia Dermatology Physician Assistants. She enjoys reading, crocheting, painting, and watching football. Tracey is married to Chris Shaffer and has two children, Christopher “CJ” Shaffer and Kirstin Shaffer.